When I called to book your staff was very helpful and knowledgeable. It was very helpful as I had never been to the area before. This cabin was everything we could have wanted - very comfortable with a 'home-like' atmosphere. The view from the deck is beautiful! We enjoyed exploring Bryson City and all the little shops there. We also went to Cades Cove, Fontana Dam, Gatlinburg and Pigeon Forge. We really enjoyed our stay here and will recommend to family and friends. Thank you! We liked your cabin very much. We enjoyed the view from the deck. It was amazing. We will be back again soon. Beautiful, clean home. A 4wd vehicle is necessary when it rains. The driveway is rather steep. The home is high on the mountain and extremely peaceful and quiet. With in 25 mins to downtown Bryson City. The largest amount of the drive there is getting down the mountain. If you need to runaway and don't want to be bombarded with tourists, this is an excellent choice. This cabin is perfect- I have stayed in that area before but I have NEVER had a view like that! The view from the back porch is EVERYTHING! 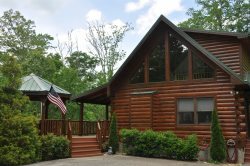 We had a great time- the cabin was clean and stocked with everything that we needed. If you like fancy caffeinated beverages make sure to check out La Dolce Vita downtown- I had the best espresso drink in my entire life there...and they also carry farm to table food products, gelato, and heavenly bakery items.